Goodsprings, Nevada. You know that long, trafficky drive from Las Vegas to Los Angeles on I-15? Even if you haven’t done the drive yourself, you’ve probably seen it immortalized in the 1996 comedy-drama Swingers. Jon Favreau and Vince Vaughn start the drive pumped up. “Vegas, baby, Vegas!” they chant. The scene cuts to them still driving, presumably hours later, no longer excited and only able to get out a tired “Vegas, baby, Vegas” as they drive the long highway with no end in sight. The drive back can be even worse–broke and tired if you’ve been to Vegas, windswept and beat if you’ve been tramping around the Nevada desert. But I’m here to tell you that there is something to look forward to on this drive, a destination even. You can break up the monotony, grab some lunch, even get in one last little thrill of exploration before the trip is over. 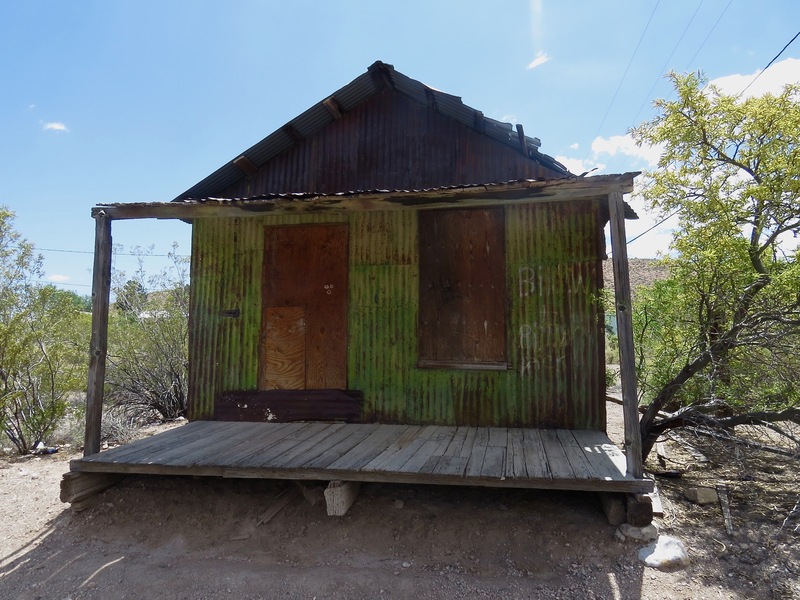 The living ghost town of Goodsprings, Nevada is located near the California, Nevada border. Its seemingly remote destination is in reality only 6 miles northwest of the roadside casinos, outlet malls, and fast food joints of Primm, Nevada. The easy detour on a paved road can take you to a little piece of history. Goodsprings, Nevada is a town that was never fully abandoned. Its boom was from 1913-1920, but it had several booms and busts through the years, enough to keep the residents hanging around for years in the hopes of another boom. Now, I imagine, it’s just home. The town was known for its rainbow of minerals and ores including lead, silver, copper, zinc, gold and platinum. 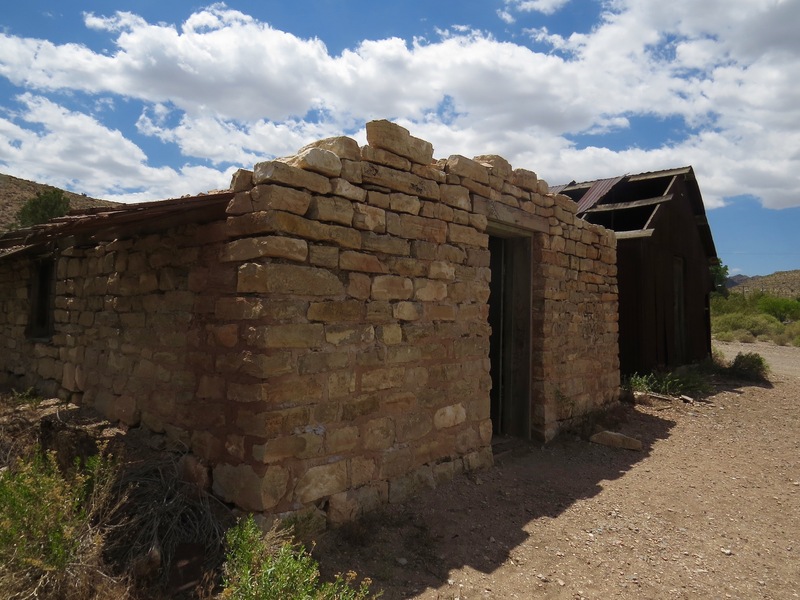 Its mining potential and the fact that Goodsprings also had water—surface pools and artesian wells–kept the town going. When the water table dropped, water was pumped by windmills and electric pumps. Contrary to easy association, the quality of the water is not where Goodsprings got its name. Instead, it was named for Joseph Good, a rancher whose cattle watered from the springs in the area. Originally named for this boon of water, today Goodsprings is mostly known for the other kind of watering hole. 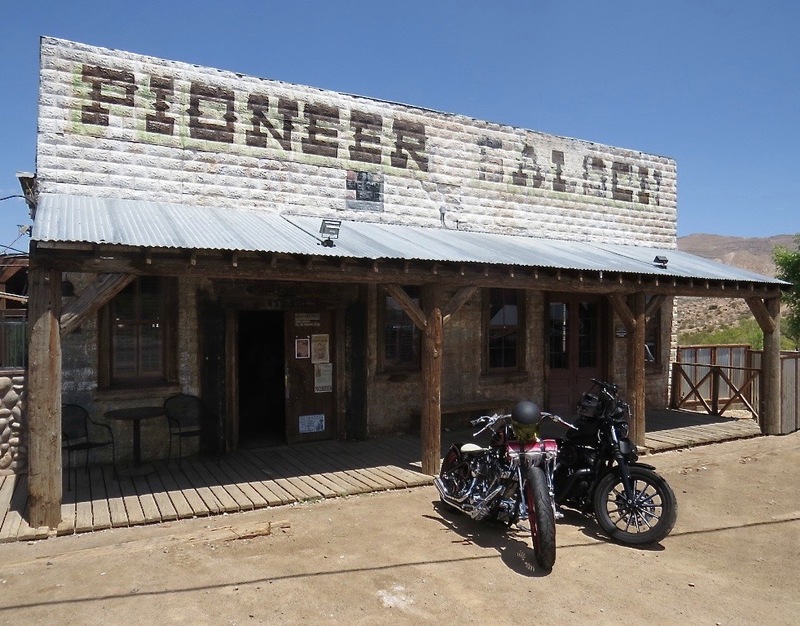 The Goodsprings Saloon was established 1913. The entire building, interior and exterior, was built and shipped by Sears Roebuck. When you walk in to see the stamped tin ceiling, flocked wallpaper and long, dark bar, it all might seem just a little too pitch perfect. That’s because it is original, manufactured to look the part of a Wild West saloon. The most fascinating thing about this architecture is the fact that the outside of the building is also made of stamped tin. Examine it closely and you’ll see that what may look like painted bricks or stone is actually tin. Architecturally, this may be the only building remaining like it anywhere. The saloon is proud of its history. It’s a colorful one, and the saloon’s website goes into detail, dwelling on the saloon’s alleged ghosts, the bullet holes in the wall left by a disgruntled gambler and the importance of the saloon for Clark Gable. On January 16, 1942, Carol Lombard, Gable’s wife, was in a plane that crashed into Mount Potosi directly adjacent to Goodpsprings. Clark Gable smoked and drank at the bar waiting for the search results. The saloon and hotel (since burned) were centers of search operations. But don’t expect to visit some shadowy version of its former self. When I was there in spring, the saloon was buzzing with live music, lunch, and the bartender’s pours. There is a general store and cafe next door and a patio to take a break from the sun and road.